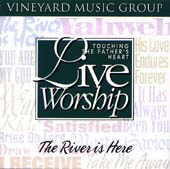 The River is Here: Vineyard Music EXTRA! This album was my first exposure to worship music in the style and focus of theVineyard, back in 1994. At that time my pastor and 3 others from our church visited the Toronto Airport Fellowship. I had never known that worship music could be so personally touching and intimate, without sounding easy-listening or bland. After that precious time of intimate worship and personal healing and blessing, I ordered the entire original #1-16 Fathers Heart series that was being discontinued at the time. From those albums to the most recent, Ive found almost every album a treasure of rich, intimate worship. Overall, this is a splendid album of reflective worship, as well as loud exalted praise, as in His Love Endures Forever. Though hard to pick an overall favorite of all the Fathers Heart releases, this one is always at the top of my list. Alan Page <page@ptd.net> serves as a lay worship leader, and worships with his wife, Donna, and his three children at Pleasant Valley Presbyterian church in Effort, PA.